What is a non-compete clause?A non-compete clause restricts the receiving party from starting a competing company or disclosing confidential information to competitors. It’s important to note that it cannot prevent people from working for competitors.What is a non-solicit clause?A non-solicitation clause restricts the Employee from hiring the employees of the Employer. It is important to note that a court may not uphold this clause if the time period is unreasonably long.What are the duties of confidentiality?Duties of confidentiality are the obligations put on the Employee to not reveal any secret or proprietary information belonging to the Employer. These duties can extend beyond the formal end of this Agreement. The Employee acknowledges and agrees that all rights, title and interest in any Confidential Information will remain the exclusive property of the Employer. Accordingly, the Employee specifically agrees and acknowledges that the Employee will have no interest in the Confidential Information, including, without limitation, no interest in know-how, copyright, trademarks or trade names, notwithstanding the fact that the Employee may have created or contributed to the creation of that Confidential Information. In providing the Confidential Information, the Employer makes no representations, either expressly or impliedly as to its adequacy, sufficiency, completeness, correctness or its lack of defect of any kind, including any patent or trademark infringement that may result from the use of such information. This Agreement will be construed in accordance with and governed by the laws of Commonwealth of Virginia. IN WITNESS WHEREOF ____________________ and ____________________ have duly affixed their signatures under hand and seal on this 20th day of April, 2019. Keep in mind, the document name may depend on the industry where the agreement is being used. A Confidentiality Agreement is used by individuals or businesses to protect information, ideas, transaction details, and more from being revealed to an outside source during the course of a business deal, project, or employment agreement with another party. When should I use a Confidentiality Agreement? What is the difference between non-solicit and non-compete clauses? A non-solicitation clause prohibits an individual (for example, a former business partner or employee) from using insider knowledge to poach or entice away the employees or contractors working for the business. Alternatively, a non-competition clause prevents a party from starting a business that is in direct competition with your business or from revealing confidential information to a competing enterprise. With these clauses, you can list a time period in which the party must abide by the duties of confidentiality (i.e. the obligation to keep the information in confidence). LawDepot's Confidentiality Agreement allows you to set the time frames for confidentiality, non-solicit, and non-compete clauses. However, in order for your document to be enforceable, the time limits and the impact the clauses have on the parties involved must be fair and reasonable. For instance, a non-compete clause typically cannot be used to stop a lower-level employee from working for a competitor. 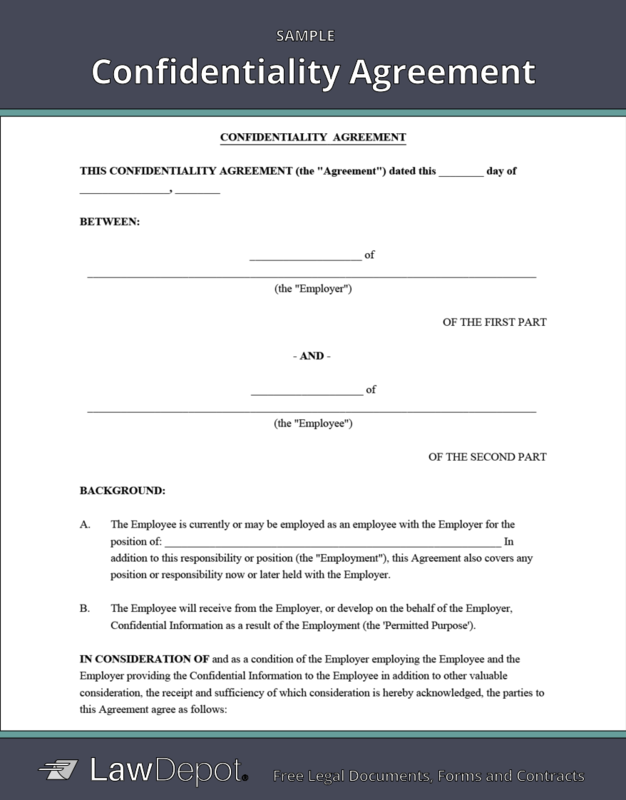 Personalize your Confidentiality Agreement template.